Your browser does not support inline frames or is currently configured not to display inline frames. Michel is the son of Aldo Platini, a former professional football player and coach of Italian descent. Aldo Platini helped his son develop his skills. The young Platini honed his ability to dribble the ball in the streets. In this respect he was different to the players developing their skills in the training academies then emerging in France. He joined his local club AS Jœuf on September 10, 1966. From his father Platini learnt early on the fundamental importance of anticipating play and knowing whom to pass to before receiving possession of the ball. Platini performed poorly in the final of the 1969 young footballers' competition, but at 16 years of age he attracted attention in a Coupe Gambardella tournament match with an impressive display for Jœuf juniors against a Metz junior side. 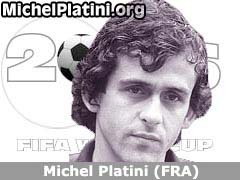 Platini was called up for a trial with Metz, but missed out on the opportunity due to injury, and was not immediately invited back after the Metz coach moved to another club. He returned to regional league football with Jœuf. Another trial at Metz went horribly wrong when a breathing test on a spirometer caused Platini to faint. The doctor's verdict on Platini's breathing difficulties and weak heart ended any hopes Platini had of playing for his boyhood favourites. He joined the Nancy reserve side in September 1972, and became friends with team goalkeeper Jean-Michel Moutier.